It was a perfect Sunday for rugby and the sakura were in full bloom as we made our way to Matsudo station. I never thought I’d be so happy to turn up to an artificial pitch, but it felt softer than Gibbo’s silk sheets after last weeks gravel patch. We also managed a far better turnout than last week, which was great as everyone could get a run and some of us oldies could take a rest. After a bit of a disjointed warm-up, the game got under way and knowing we had only thirty minute halves, we needed to make a strong start. Unfortunately we struggled to hold on to the pill. We’d make some good breaks and then we’d throw a wobbly pass or just drop the ball cold, like yours truly did when he could have put Dom in the clear. Three possessions, three turnovers. As a result, we were forced to put in a lot of defense for the first 20 minutes and then the penalty count kept racking up against us. The final penalty count was 13-4, which would be reflective of the possession stats and something we need to work on. But still we managed to hold them out but we couldn’t do it forever and they opened the scoring. 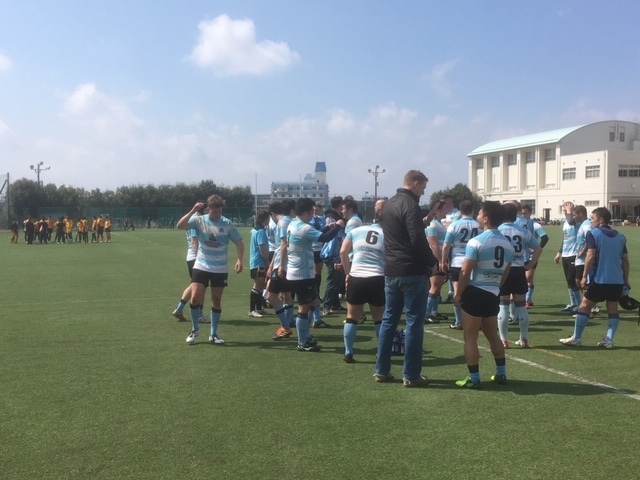 It was more of the same in the first half, with Matsudo running a very well-drilled and effective team game based on building phases and pressure, while the Cru relied on strength and individual plays to break lines and try to link-up. One thing Matsudo did very well all game and something I think we can learn from was their aggressive one-off runners from the ruck. Every ruck they had, they never went straight to the backs but they always had one forward who put their hand up and charged fearlessly at our defensive line, followed quickly by support players clearing out. To our credit, they rarely broke the line but that structure is something I think we can learn from and try to adapt for our own game plan. They also had an excellent kicking game and used the wind to their full advantage in the first half. But Tomo, Benji and Alby did a superb job in the back three cleaning up and getting the ball safely under control. In fact, they were successful late in the second half by doing this repeatedly – charging at the line and drawing in our defense time and again, until after about 8 phases our defensive line was more crooked than Brett’s new nose and they spun it out wide to find plenty of space and overlaps, resulting in a try run under the posts. Oh, how I wish we could build phases like that. On a brighter note, I thought Nathan did an excellent job jumping in the lineout and we managed to steal a couple of lineouts and I think we actually won a few of our own, so there’s that. At the half the score was 10-5 and the message was pretty simple – keep the ball in hand and keep having fun (which is much easier when you have the ball). This timely advice, coupled with some impressive subs, managed to have the desired effect as after the first scrum, Matyas (whom we welcome back after a long hiatus) managed to make a charging break through the midfield, setting up a Crusaders try to Suguru to open the scoring. There was some more impressive back play a little later with Suguru seemingly jogging through the defensive line of an impressive right-foot step and then a lovely draw and pass on the fullback to put Dom in under the posts. We got a leg-up from the Ref after we went to non-contest scrums, so that helped us secure clean ball at the scrums for the remainder of the second half. This was soon followed by another storming run by Kyle (another Crusader we’re happy to have back in the squad after a long hiatus) which took us up to over the halfway line. It wasn’t Kyle’s first run of the day and it was quite fun watching him charge over the brave and unfortunate Matsudo would-be tacklers. A couple of passes later and Kyle’s storming run turned into a try for Suguru and that gave the Cru a slight edge on the scoreboard at 22-20 with just a few nervous minutes remaining. The Crusaders either needed to score again, or just hold out the opposition for a few minutes, although they always looked threatening. We managed to get our hands on the ball in what we thought on the sideline was the last play of the game and a run down the blindside ended up in a wide pass to Chris on the wing with space in front…but he dropped it. C’est la vie, we thought, as that was the end of the game but it turned out there was still room for one more play. Matsudo were determined to score again as they’d played well all game, but the Cru knew we were a better side and were not going down without a fight. Matsudo managed to, yet again, string a number of phases together to march down the field and get inside our 22. Their strike-rate from the redzone all game had been very high so we were all nervous. But, our defense held-out, they knocked the ball on and the Ref blew the whistle to sighs of relief from the Cru. What won us the game was our defense. We have plenty to work on in attack, including our lineouts, scrums, backline passing and catching as well as linking up with each other, making better decisions about kicking…the list goes on a bit. But we should be proud of how much our tackling has improved since a few games ago. I’d be remiss if I didn’t mention the man who led this tackling charge from the front, our man of the match for the day as voted by Matsudo and his teammates – Paku. I think I speak for every Cru member present on the day when I say how much fun it was to watch Paku charge the defensive line full speed at runner after runner after runner all game and put in some bone crunching tackles. With an apparent complete disregard for his own health and safety, he showed us what a real rugby player can do with a bit of determination and technique. Similarly, their man of the match for the day was their #8, Sato-san, who was probably on the receiving end of a few of Paku’s tackles as he also ran with grit and determination and kept attacking our defensive line. 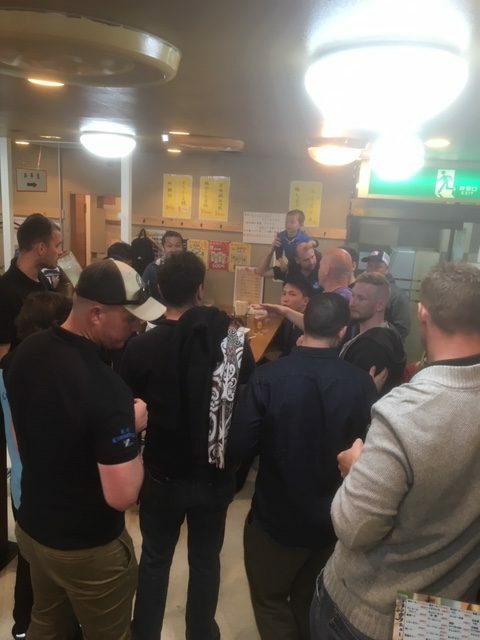 After the game we headed in full force to our local Ojisan bar in Matsudo to celebrate and enjoy some massive beers and plates of fried food (although me and Leo being kiwis couldn’t walk past the KFC next door). 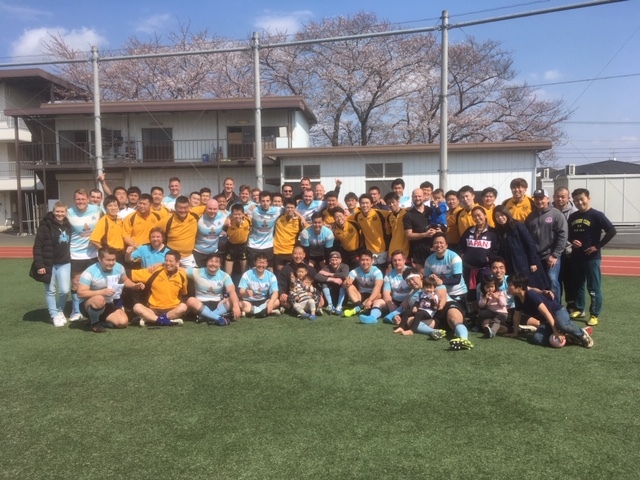 Special thanks to Tomoe for running the Crusaders day-care for the day with four Crusader kids coming along (Shiho, Seiji, Leo and Koh) and thanks to Libby for coming out to support, too – it’s always great to make rugby a family day. Hopefully Patrick remembered where his new job was on Monday after a big knock to the head and made it there safely (best of luck btw). Again, welcome back to the Cru Kyle and Andrew – it’s great to see you in the baby blue again. Also congrats to our debutants…. Now we look forward to the Tokyo Cup, but not before we try to get in a practice or two. Big thanks for our referee, Sasaki-san, who did a very good job keeping up with the pace of the game and managing to keep on top of things.